If Carlsberg made Bluegrass bands ……..
Several years ago the beer makers Carlsberg had an advertising campaign suggesting that if they were involved in creating anything no matter how obscure; the end result would be the best in the World; hence my tag line. 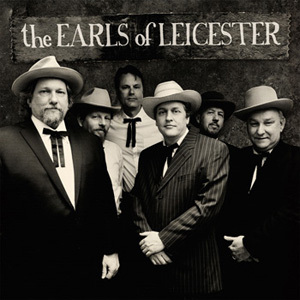 The Earls of Leicester are the brainchild of legendary Dobro player Jerry Douglas, who has assembled a veritable Supergroup of Bluegrass players and even to the uninitiated like myself that class oozes out of every note hear. Whenever I review a Bluegrass album I always have to add the caveat that I don’t like Bluegrass; so for an Album to keep my attention all the way through and even choose to play it in the car makes it somewhat exceptional and that’s exactly what we have here as The Earls pay homage to the Masters of the genre Flatt and Scruggs. While purists might pooh-pooh at the idea I’ve found the production values and actual playing ten times better and more interesting than the originals (I have listened to them); probably because modern techniques make the sound much warmer and friendlier to the ears and the guitar and fiddle playing (especially) is wondrous to behold. I may not be aux fait with all of the originals, but Don’t Let Your Deal Go Down and I Don’t Care Anymore are absolute doozies and Dim Lights, Thick Smoke had my toes a ’tappin and me trying to sing harmonies; which is both dreadful and funny. I doubt if my review will make a ha’poth of difference to sales as Douglas and his ensemble have fans across the globe who will gobble this up by the bucket load; but if all Bluegrass was as good as this I could come dangerously close to becoming a convert.